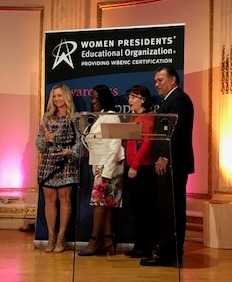 The Women Presidents’ Educational Organization (WPEO) announced that Coranet won the 2018 WPEO WBE Done Deals Champion Award for reporting the most Done Deals with WPEO Corporate Members during the challenge period. Coranet also won the 2018 WPEO Access New York City Award for reporting the most Done Deals with the City of New York during the challenge period. Sandy Cadeau, Project Manager for commercial clients, accepted the Done Deals Champion Award on behalf of Margaret Marcucci. Account Executive Angela Cigolini accepted the Done Deals Access New York City Award.